With the uncertainty of life, we let go when we have exhausted all means of control. Sometimes it takes us longer to finally come to the conclusion that there are simply parts of life that we must allow for we cannot stop them. For a planner like me, it’s always felt unacceptable. Searching my brain, I would try to come up with endless ways to make whatever situation better for me, my family, my friends ~ relentlessly trying to improve a situation that I found unacceptable because it was causing someone else or me pain. But there are times now, after sleepless nights of fret, worry and planning, that I am learning, albeit slowly, to let go and to allow God and the Universe to proceed. What I’ve learned in the wee hours of the morning is to go with the flow, release, let the river take its course and have faith that as long as I can put my head on the pillow in peace, knowing I have done all with a loving heart, there is nothing more I can do. However, it’s hard ~ this letting go. So I am learning to let go and let God ~ and let Him in. I think it’s human nature to believe we’ve got this, we can figure it out and make it work. But we forget that there is God, the Universe and the Laws of Attraction who also carry us when we allow them to work their ‘magic’ as well. Being in the present moment is a life lesson worth learning for me. I am watching my Mom struggle with Alzheimer’s and being in the present moment with her. Sometimes her present moment isn’t ‘reality’ but wherever her brain is at the time. So to honor her, we gather in her present moment and support her, enjoying whatever gifts we can. It’s a shift of thinking that has taken me a long time to accept and to process in my own brain. However, love is accepting and above all, I love my Mom. So I accept where she is at any given moment. I’ve come a long way baby, but I still have much to learn. Isn’t that the way life school is anyway? Learn, practice and love? It is truly time to allow, to let go and to find a way to not fix it all. I was/am? a person who liked to be in control. Not demanding mind you, (at least I didn’t think I was), but I liked to know the plan and execute it. We may sound similar if you are reading this post. But I have learned that through this journey, I’ve had to let go and it is still hard for me to do. But in letting go, I’ve opened up to an abundance of awareness, growth, love, friendship, connections with others and had an incredible soul journey that would not have been available to me had I stayed in the control, fix it place. Because, what hit me was the line, ‘who died and left you boss? You are not God,’ which I hope does not offend you, but perhaps gives you the added boost to see from an observer mode instead of the path ahead (that we had planned so carefully) that has literally fallen to pieces. I see the path ahead now, strewn with debris and sometimes avalanches of emotion, hurt, betrayal and sadness. But there is still a path and as I take baby steps forward, I can clear the debris, learn from the experiences and keep moving on. I’ve found that there are others on this path that help me as I help you and as you help me to move forward. And then also to rest when needed. I’m not asking you to give up control or to stop fixing…I’m only asking you to accept what is unacceptable as part of the journey of life and to find peace in your heart to welcome the lessons as they will make you stronger in body/mind/soul. It’s a great leap of faith that is your opportunity here. I’m not saying that you need to find God as I don’t even know how you feel about religion. I believe in God, Divinity and the Universe. I am comfortable in being spiritual and using what I learn by reading, by communicating and by connecting with others and I find that I am making my own way, picking and choosing what feels right to me at that time ~ and sometimes choosing again when it’s not serving me. That’s the beauty of life. Many of us come to this life with the idea that everything should be hunky dory because we’ve worked so hard to make it be as such. We strive for the even keel and smooth sailing, but storms arise, even in nature and we must accept that piece in order to find peace. There comes a time in life when we need to grow, to expand our horizons, to search for our next level of understanding in life. Fix yourself is the first lesson. Take care of you ~ nuture yourself, grow in your understanding, be patient with yourself and others, read, meditate and allow. Allowing yourself 5 minutes of silence in which to simply breathe and focus in the morning and at night helps. You are in charge of you. You are not in control of anyone else on the fixing level. Every single person has free will and can choose how they live their life. You are not God. Allow Him to do His job and you will see how amazing life can be! Calm. 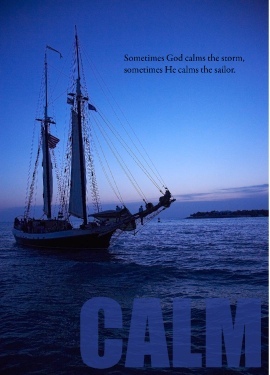 Sometimes God calms the storm, sometimes He calms the sailor (Superwoman). It’s been 12 weeks since my Dad passed away…12 weeks! I can hardly believe that 3 full months have passed and that I’m still ticking off every Thursday afternoon as another week. I saw this card and thought it was perfect for me because I’ve been feeling very stormy lately. There is much going on in my life in addition to my Dad’s passing and being in charge of the subsequent details of wrapping up a human life’s affairs and business. I am still in the midst of the eye of the storm. However, I had an epiphany yesterday ~ so similar to this card that I had to write today. You see, my stormy seas aren’t going away any time soon because there is still much to do for Dad, for my family and I am still healing from my surgery 2 weeks ago and have another scheduled for October. The seas are really choppy for me right now, testing me and tossing me around with tear-filled moments. So I’m asking for God/Universe/Spirit to calm them, but more fervently, I am asking for calm for me. You see, I’ve ridden stormy seas before with my breast cancer and other life challenges…I see them as a kind of test that we are put through…and this one is again, a test of a huge magnitude. When I sit quietly which I have been doing more often lately now that the kids are back in school, I realize that my plate is overflowing. I expect a lot from myself and in this moment, there is no exception to that rule. In fact, before my epiphany, I was unable to see that perhaps I am not quite the Superwoman I expect myself to be. In fact, there have been times recently that I have been full-blown disappointed in myself for not keeping up, for not doing it all, for not being able to clone myself into the 5 different roles I need to be 24/7! I’m re-reading a compilation by one of my favorite authors now…and later on, I’ll tell you all about her, but her method is simple and it works. In the hustle and bustle of these seas, I’d allowed myself to get tossed and not navigate my own life. I hadn’t asked for help from anyone. I’d simply loaded myself up until I crumbled. Isn’t that the way many of us do it? Superwomen/Supermen…we just keep taking on until we can no longer fit anything more without drowning. Well, I’m not drowning ~ nope ~ not even close! I took hold of the rudder this weekend and decided to steer my own ship through these waters. I cried “UNCLE!” and gave it up to God/Universe/Spirit. I handed it over ~ cast the burden so to speak ~ so that I could allow myself healing time. I need to concentrate on growing my ‘self-love’ which I’d tossed by the wayside in the turmoil.